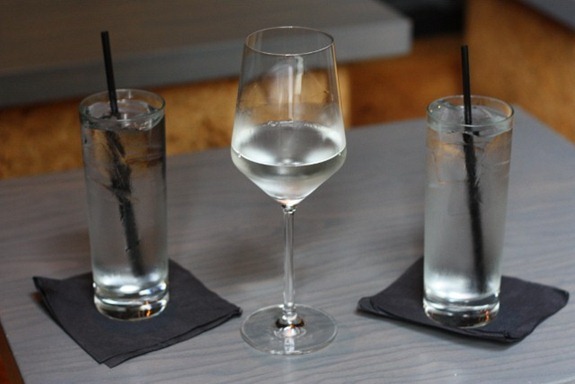 We’ve declared once a week a date night to try a new place. Tonight was it! After much debate about the fat raindrops falling from the sky upon our departure, we ended up driving. 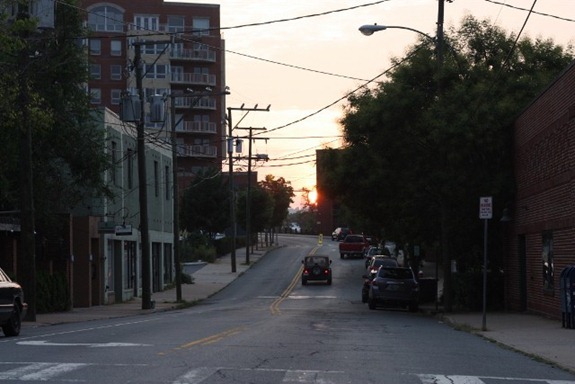 And since we were driving, we drove downtown and took advantage of the longer distance in an automobile, saving the closer restaurants for a walk / bike night. We’ve eyed TEN multiple times and have never gone inside. Tonight we felt like something different, so modern Japanese sounded great. Great view! We even spotted ANDREA on her way out of work!! Matt ordered a sake. I’ve never been a huge fan – it reminds me of vodka! Blech! HOWEVER, this sake was quite delicious with the FOOD! The spicy, salty sushi and soy sauce we had complimented it so well. Starting with "lightly grilled mackerel." I’d never had mackerel but I know it’s on all the "best fish" lists for omega-3s, so I decided we should try it (we have come to love sardines, herring and of course salmon). It tasted a lot like sardines – but a bit milder. And I loved the seaweed bed! The soy sauce here was better than any I’ve ever had!! 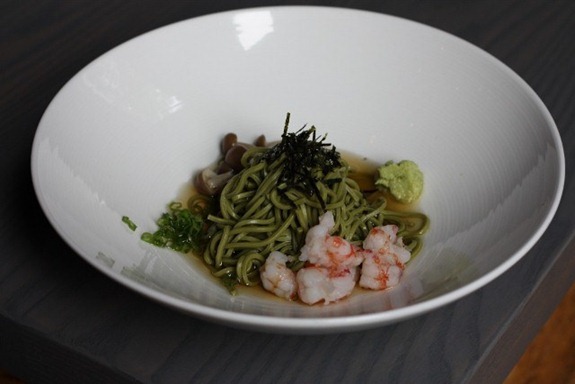 Second we had Green Tea Soba noodles with shrimp and mushrooms. LOVED them. I love soba noodles a lot, but they are so expensive! I need to find an Asian store to get some for less. Some kind of white fish, avocado, raspberry and a raspberry syrup. It was INCREDIBLE! I had raspberry on the brain!! I never order sorbet, but raspberry was so fresh on my tongue and mind, I had to have more. I got a coconut + raspberry sorbet gelato – out of this world good. Matt got pistachio + butter pecan! About to embark on 2 weeks of complete [and very fun] travel madness. Up, up and away! I would never have thought raspberry to work with sushi–who knew?! I’ve never had raspberries on sushi before!! It looks so refreshing!! Wow looks like an amazing meal!! I’ve never seen raspberry sushi before but mango and pineapple go so well with fish – it makes sense! I eat about 95% vegan and I must say that raspberry sushi definitely looks amazing! Probably would have tempted me…..maybe. 🙂 Can’t wait to hear all about your travel adventures and meet you at the Healthy Living Summit! Wow. Never before have I wanted to try sushi… until I saw those two rolls. I want to try those so badly!!! That rasp. roll is gorgeous! I am heading to Japan in 2 days…hopefully I will find the same deliciousness there. Oh yum, that sounds great! 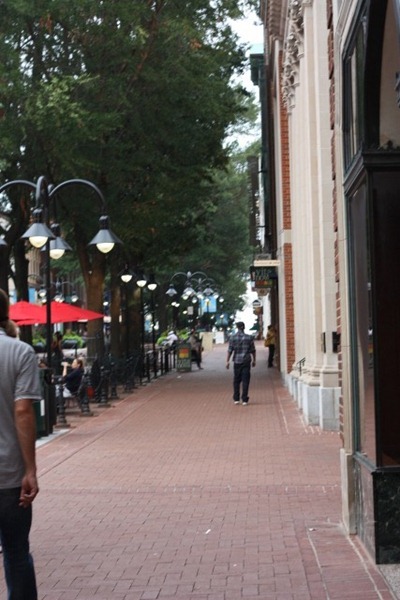 Charlottesville sounds so awesome – tons of great restaurants and very atmospheric! That raspberry roll looks incredible! I’ve never seen those — in fact, living in Asia (at least it Korea), it wasn’t common to see raspberries at all. oh my – how interesting is that rapsberry sushi? I have never heard of anything like it! Such a gorgeous city and that sushi looks to die for! So glad you had a great night out on the town before your big trip! Looks like tonight was full of deliciousness! That place looks awesome! and shushi’s definitely an all time favorite of mine. I like the idea of trying somewhere new every week. Then you get a taste of everything and explore the town a bit! 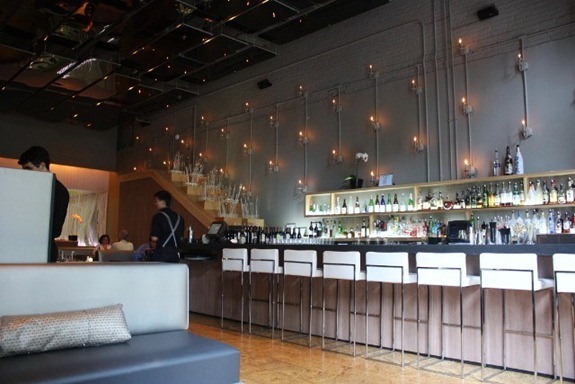 What a cool looking restaurant! The sorbet sounds delicious and the sushi looks amazing! Very beautiful! I am glad you had a good evening. Wow. Raspberries = favorite fruit. Sushi = favorite food in general. That must be an amazing dish!! I wish a sushi place around here offered something like that! 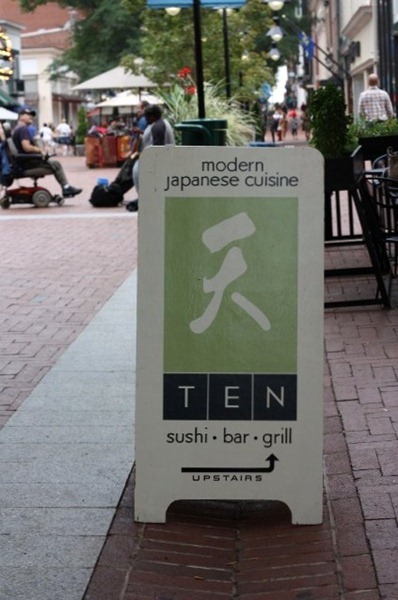 Glad to see you found an enjoyable (and clean) sushi restaurant for dining out! I just think it’s too watery/icy! I always want creamy. That is some very unique sushi, love it. Green tea soba noodles sounds really good. Try World Market for soba noodles. I don’t remember exactly how much they are but I know they were cheaper than the whole wheat noodles I usually buy. They’re my favorite too – I stock up whenever we come upon a World Market. Man, I wish all my walks led me to a gelato place, haha. Looks like you and your husband had a very nice date night! Those dishes are GORGEOUS! Very innovative rolls. There used to be an Asian Market next to C’Ville Market in Belmont. Hope you find your soba noodles! That raspberry role looks AWESOME and very unique! Ben + I have also designated 1 night a week to trying a new restaurant in the Charleston area!! SO FUN to have so many new places to try! Why can’t I live somewhere with good restaurants?!?! My stomach just growled through this entire post! My favorite sushi roll has mango in it. It is so delicious! I like Matt’s outfit! 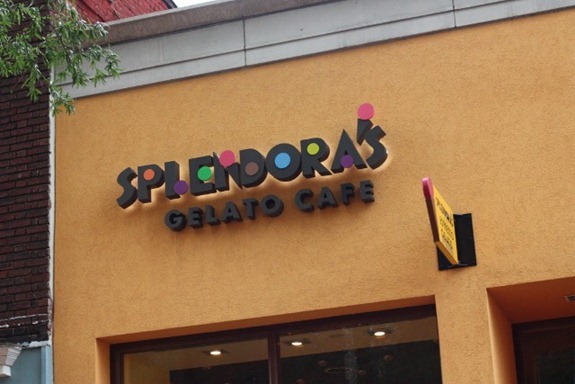 And your gelato looks yummy! I have never had gelato before. How is it different than ice cream? Yum! Looks like so much fun! My husband and I need to start a date night! Love reading of your adventures! Looks SO good! I love sushi & that sounds wonderful right now! Fun Date night in your new town. I hope all the airline travel goes well. I don’t tend to like Asian flavors at all, but those raspberry rolls look KILLER. Did you eat them “straight up” or with soy sauce? Safe travels ad much fun, Kath. I look forward to reading of your adventures! looks like such a cute area of town!! never seen raspberries on sushi! Matt looks very sweet in the picture of him looking at you sideways. The food looks good! I love sushi. 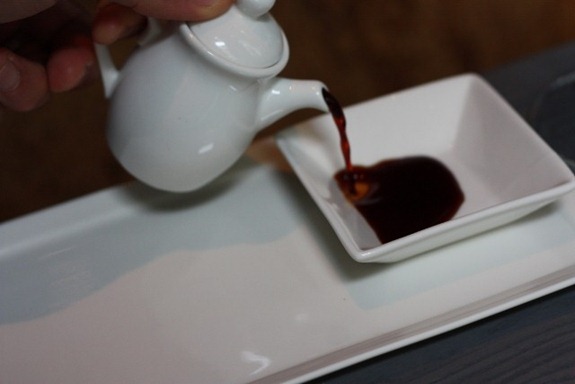 I think the soy sauce might be better because do you know many places make soy sauce without soy?? It has other stuff in place of it. Weird. I read about it in a book about Chinese food and how it came to be how it is today (i.e., not like real Chinese food). There’s a small Asian grocery store on 29 (almost across the street from Bodos)- not far from UVa. Can’t recall the name, but it’s close to a diner – if you hit the Best Buy on 29 (coming from the University) – you’ve gone too far!! That dinner looks amazing! I do love sushi, but I think the mackerel dish with the seaweed looks the best. Yum! Very handsome picture of Matt! 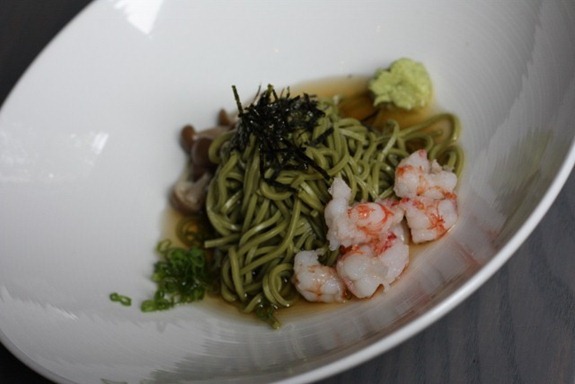 Oh, you had some of my favourite Japanese eats – green tea soba and seaweed! Mackerel is a fantastic fish – I make a lovely dish using mackerel on a bed of thinly sliced fennel and onion (which, obviously, you’d avoid!) with dill and white wine and other aromatics, all baked in teh oven. So good! 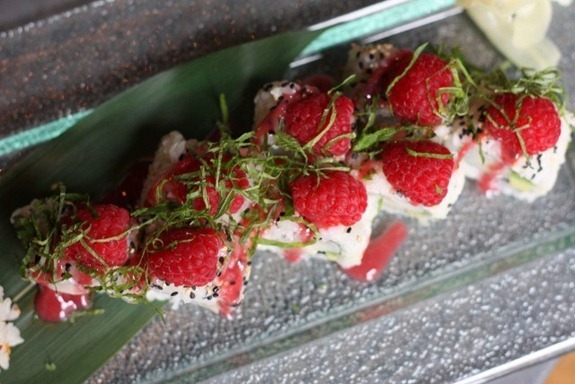 whoa raspberries on sushi!? That sounds like my cup of tea for sure. Even though I’m not a huge fan of sushi I think I could rock that. Oh. My. Gosh! Those raspberry rolls look delish! looks so good! …although I only had sushi once! I had someone order it for me that time and haven’t been back since because I would have no idea where to begin! 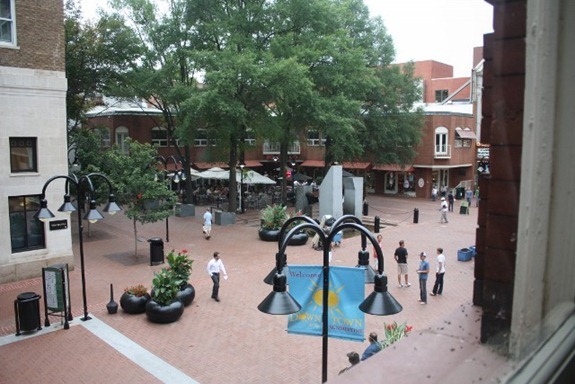 Charlottesville looks so cute and the ideal place to live! Moving is such an adjustment, just give it time! Before you even blink you’ll be settled and remembering when…enjoy this time of discovery! I hate mayo also. Mix your tuna with plain yogurt for an alternate way to make tuna salad. It tastes great and no mayo taste. Sushi and ice cream is the best combination in the entire world! Not a huge raspberry fan, however, those raspberry rolls look delicious. i rarely get sorbet when i’m out too, for some weird reason. it’s an at-home thing for me and gelato i always have when i’m out! Your town looks absolutely adorable. I love all of the cute restaurants. Your food looks AHHmazing! Oh my gosh. I LOVE LOVE LOVE sushi. Those rolls look fabulous. Sometimes my husband and I make sushi and get crazy with the toppings and fillings. So much fun! i’ve never seen raspberry with sushi before! that sounds interesting and looks delicious!!! 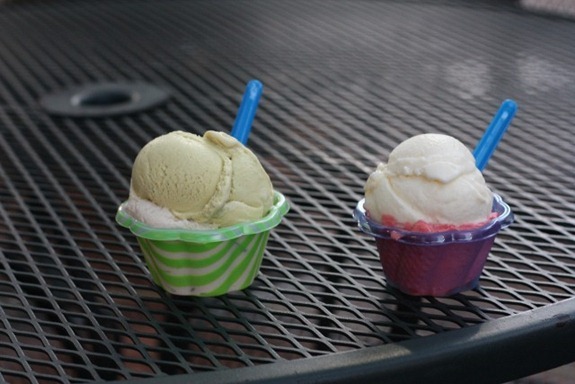 oooh, and now i’ve got gelato on the brain…must find gelato asap! That raspberry sushi looks remarkable! What a brilliant fusion. I love pretty much anything on a Japanese restaurant menu, so this post really amped up my cravings for sashimi and sushi. Looks like you had a lovely date night! That coconut gelato sounds delicious!! 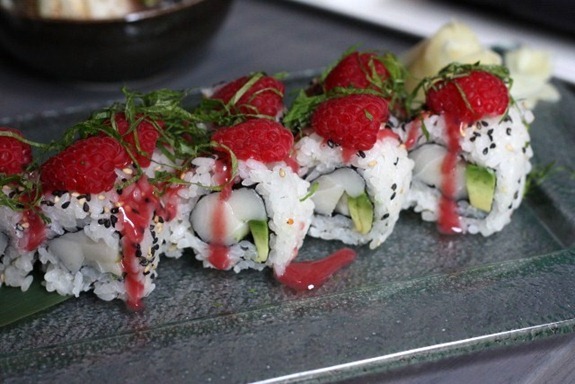 I also love the idea of raspberries on sushi. Sounds really good. So if you and I ever go out for sushi, you can have my fish and I can have your sake. Love it. That’s such an interesting sounding meal – raspbverry and white fish sushi? wow! I like the idea of a weekly date night! Looks like you had a lovely evening, date nights rock! What a handsome photo of Matt! If you liked the mackerel you should definitely try smoked mackerel – it’s so tasty and high in omega 3s. It’s delicious in salads. Yum! Raspberry sushi sounds amazing! I’m really wanting to get into adding fruit to more things for a bit of variety. I just can’t imagine how fish and raspberries would be! Raspberry in sushi! I need to hop on a plane and fly over ASAP! We do date night once a week and often just let ourselves buy more expensive products at the store to make a fun dinner – still saving money and having a great time! 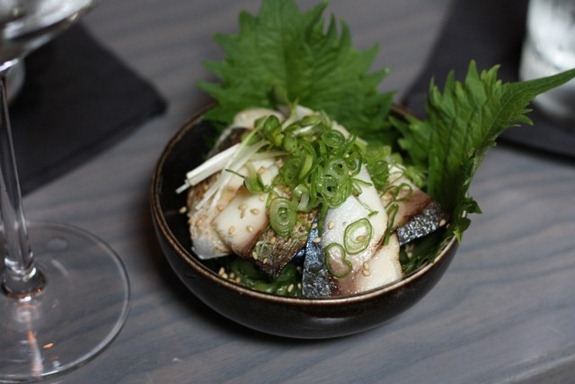 Next time try the seaweed salad at 10…its delicious! The Asian market that the first Emily mentioned is still there. You should definitely try it out and don’t miss CVille Market right next door. Both are on Carlton Road in Belmont. The World Market is out on 29 right by the 250 bypass if all else fails. 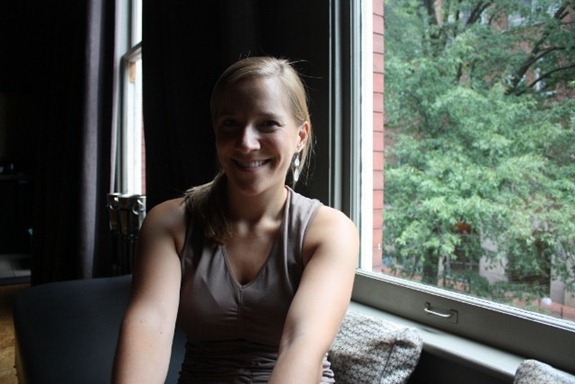 I love that you’ll be trying a new restaurant every week.I love date nights! That raspberry roll is so beautiful! And I loved the little avocado peeking out in the roll. I know you’ll have a great 2 weeks traveling. Enjoy it! I love it when restaurants offer creative sushi rolls! 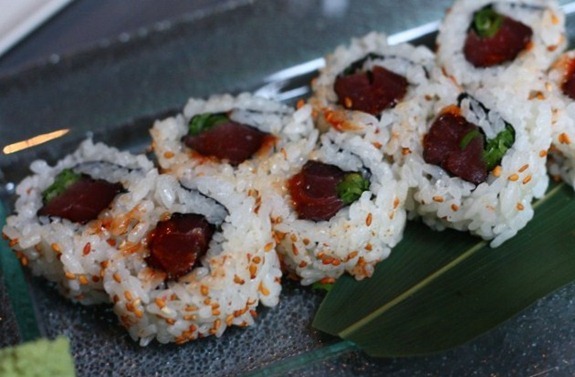 Both the tuna and raspberry roll look delicious! coconut + raspberry gelato!!!!! I think that should be renamed — pure bliss. Mmm, that last picture with the sun peaking out is just gorgeous–a little romance for your date night, I think! That’s exactly how I feel about saki. I can’t help but think of it as a shot so I have a really hard time sipping “hard liquor”. I made my own take on your millet, roasted veggies, bean dinner last night. It was so delish. Your site has really inspired me to cook and eat healthier foods. Thanks!! 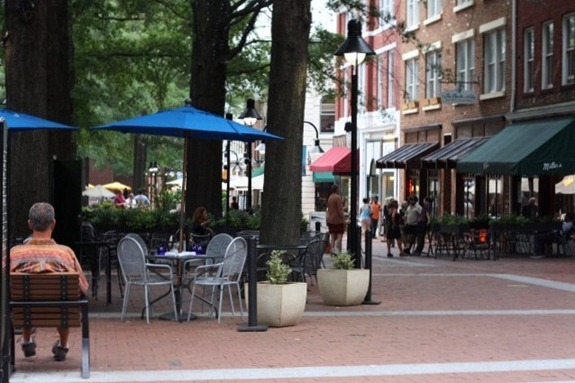 So many cool restos in Cville! Thinking about visiting!!! I love sushi so much, but I love gelato more! I’m so jealous of you right now! I’m jealous Kath – looks like you and Matt had a fantastic time at a beautiful restaurant. I wish I could afford to do that every week! That raspberry sushi looks sooo gooodd want it right now! Hmm I might actually like sake if it is like vodka! Vodka has always been my drink of choice! I can’t stand sushi, although the raspberries look good! 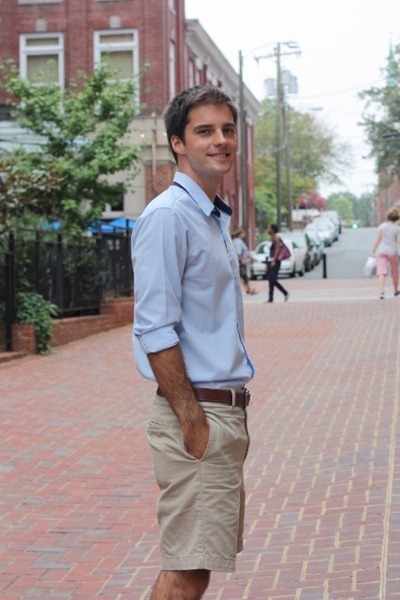 I can’t believe my luck – I recently found out I’ll be in Charlottesville for work later this year, and now discovering your blog, I’ll already know of some great places to check out – keep ’em coming! There is a newer Asian Market that’s pretty large and extensive up near Giant on 29. The one near Bodo’s is the one I frequent, but it’s not as nice as that newer one. I love Splendora’s! My favorite flavor is the Chocolate Hazelnut one. Yum! Wow! you guys are so cool, and having so much fun….